f/4 to f/22, 43mm filter size, close focus .9 meter, weight 141 grams, 7 elements in 5 groups, same optics as Voigtlander 25/4 Leica mount lenses! Only 800 lenses produced! New SC Skopar owners will be pleased to find that the mechanical fit and finish of these lenses is quite high in today's age of plastic. The mount is more complicated and requires quite a bit more machining than the Leica screw mount lenses. Everything about them from the focusing, aperture rings, and mounting works smoothly. The 21/4 and 25/4 are sold with superb brightline finders included. The 25 brightline is a 1st for Voigtlander, as the 25 finder made the last few years for the Leica screw mount version of this lens is not a brightline design. Their views are bright and clear with practically no distortion, making them a joy to use. Incredibly Cosina Voigtlander introduced the Voigtlander SC lens series for classic Nikon and Contax rangefinders in 2001, four decades after these cameras were discontinued. These are LIMITED production lenses. Initially only ONE run of each is scheduled: 900 21/4's, 800 25/4's, and 700 35/2.5's. Alas, there was ONLY one production run due to slow sales. It was early June 2001 and but it seemed like Christmas. I opened a box of three new 21, 25, and 35 SC Voigtlander pre-production lenses. After the studio shots of the lenses, I packed up the camera bag and drove south to Long Beach for a few pics of the retired ocean liner Queen Mary and the Russian submarine now alongside her and open for tours. I can't be absolutely sure, but I may have been the only photog shooting the Mary that day with a set of the new SC lenses mounted on black motorized Nikon SP's. Grin. Shown to the right is the Voigtlander SC 21/4. It shares the same outstanding optics as its Leica screw mount counterpart. The original Nikon 21/4 is a very rare and expensive lens, with only about 300 being produced. Even if you have one, the finder is mediocre. More plentiful but still hard to find is the Zeiss 21/4.5 Biogon for vintage Zeiss Contax rangefinders -- which will also fit the Nikon rangefinders. Again it has a not so great finder. 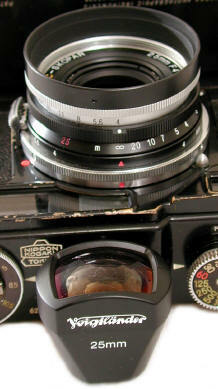 Real world, the result is that most Nikon Rangefinder shooters or collectors have never shot a 21 lens. You can't shoot with something you can't find or can't afford. The vintage 25/4 Nikkor is also rare, expensive and hard to find. Cosina Voigtlander is doing a wonderful service for these classic camera owners by producing new modern affordable wide angles. No "big" camera maker would ever think of such a thing, making lenses for such a small market. 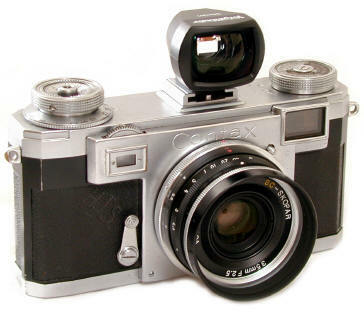 Classic camera owners have Cosina's CEO Mr. Kobayashi to thank for this otherwise unbelievable turn of events. A serious photographer and collector, Mr. Kobayashi appreciates the experience of classic photography equipment and is willing to go out on a limb to produce for that market -- something no other major manufacturer is willing to do. Sold with front and back caps, and a screw in lens hood. The 21 and 25 also have a brightline included. Focal length marked on the barrel in not too easy to see small red letters. I wish the numbers were bigger and in white. 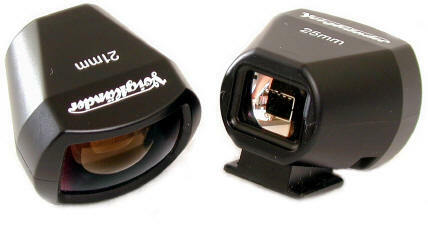 INCLUDED with the production SC wide angle Scopars are very useful focusing wheel attachments. These attach OVER the lens barrel, making them much easier to grip and focus if you prefer lens barrel focusing to the index finger focusing wheel on the camera body. The SC 21, 25, 28 and 35 fit into the 12mm VL-2 case, but not into the smaller VL-1 case for the Leica mount 21/25/28/35C. The SC 21, 25, 28 and 35 Wides fit Classic Contax Rangefinder Too ! 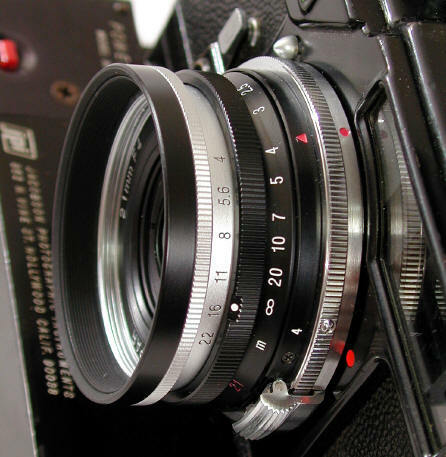 The Voigtlander 35/2.5 mounted on a post war Zeiss Contax IIa. Nikon copied the Zeiss Contax bayonet mount and back focus, but did not use an identical rotation from close-up to infinity. The difference is generally considered negligible in wide angles, but gave focusing problems in interchanging Nikon and Contax tele lenses. 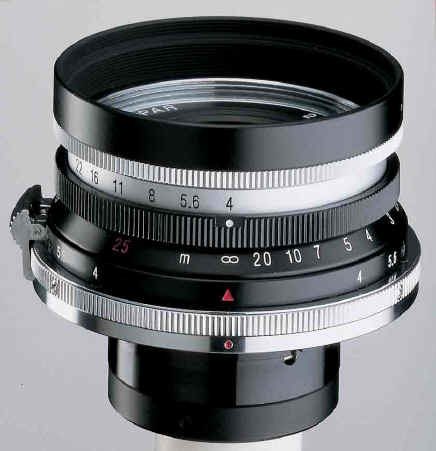 Contax RF's make a sensible and lower cost wide angle companion body for Nikon Rangefinder shooters. The 21 Voigtlander on a 1932 Zeiss Contax 1a, and the 25 Voigtlander on a 1938 Contax II.